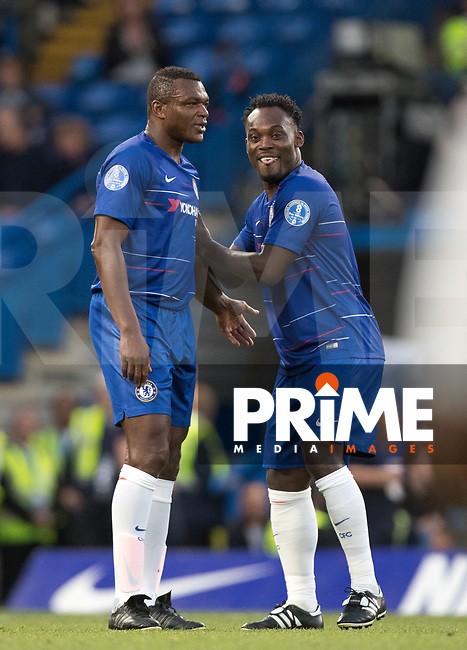 Michael Essien and Marcel Desailly and a host of other football stars have been named by Federation of International Football Association (FIFA) to promote the FIFA Women’s World Cup 2019 and the women’s game in general. The campaign would see these illustrious footballing personalities harness their sporting superpowers and turn into superheroes on a mission to promote the FIFA Women’s World Cup 2019 and the women’s game in general. Some of the biggest stars in football named in this campaign includes, Alex Scott, Marcel Desailly, Nadine Kessler, Michael Essien, Laura Georges and Gilberto Silva, have assembled as part of a 23-strong FIFA Legends squad for a campaign. With just four months to go before FIFA’s flagship women’s football tournament kicks off, 23 current and former players, representing 19 of the tournament’s qualified nations, are coming together in a one-of-a-kind promotional initiative to support the FIFA Women’s World Cup France 2019. They would also drive match attendances, increase TV viewership, generate engagement and inspire a new generation to play women’s football. Made up of 13 women and ten men, the squad members were selected for their superhuman qualities and unshakeable commitment on and off the pitch. Each has had to overcome obstacles in the face of adversity and as part of the campaign and the wider FIFA #DareToShine movement, would be encouraging women and girls to push boundaries to succeed in all areas of life.